beIN SPORTS's tweet - "Don't question Mourinho's philosophy! 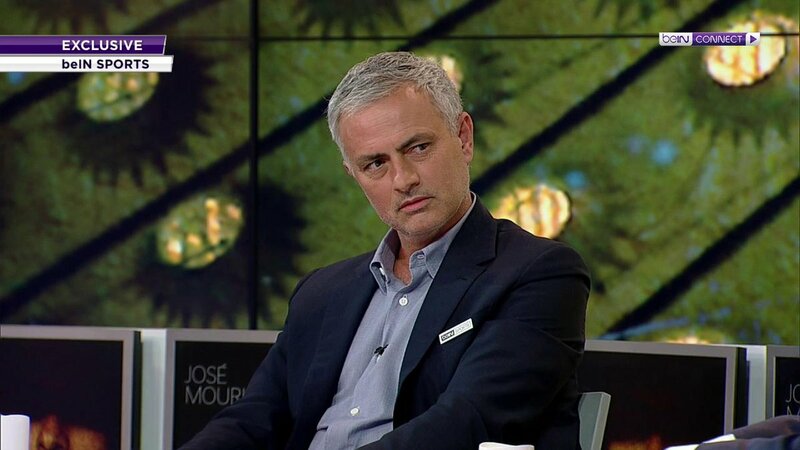 #beINMourinho #beINPL #ARSCHE "
#beINMourinho er en urovekkende hashtag. Mourinho sur l'élimination du Barça par l'Inter en 2010 :"Les gens aiment rappeler qu'on a livré une performance défensive masterclass au retour, que c'était ennuyeux...Mais ils ne disent jamais qu'à l'aller, Inter 3, Barcelone 1. Et qu'on pouvait en marquer 4, 5 buts..."
Vile person. End of. You can twist and turn this in any way, shape, or form. Doesn’t change the fact that you are not a leader. A manager, yes, but never a leader. Jose divides, he does not unite. Wow! He’s right at home with Keys and Grey! Is he for one minute suggesting that Klopp has had more funds available than himself? The difference is Klopp is signing players that fit the business plan. Mourihno wants to buy a team! £80m on 29 year olds etc. The board held him back. Some very valid comments. I fully respect Mourinho and what he’s achieved in the game & am excited to see his next challenge. He's spot on here. Wanted it to work but something happened and players downed tools. Still won 2 pots and brought in Pogba, Dalot, Lindelof and Matic who all played well today. Genuinely could go and support whichever club this man goes to now. If football wasn’t some kind of weird love addiction where it’s hard to love another team. There is only one Jose! Cuanta sabiduría la de Mourinho! Vale la pena escuchar cada palabra. También Marina debería escuchar sus palabras. El club ha tenido muy pobre mercado. ¿Cuantos jugadores de los que alinea Klopp o Pep estuvieron antes de su llegada? Practicamente todo lo han comprado. Depends. ....what is depends? He doesn't even know his phylosophy. lmao Mourinho is box office. He's so bitter about Ed Woodward and tbh you can't blame him. All respect for MY manager. I don't remember a time, when a coach lost his job at a club, then he goes on a campaign, to show why it was not his fault. I thought José #Mourinho said earlier, he wouldn't want to talk about his previous employers. But he is here suggesting d @ManUtd structure wasn't right. I can understand his view, but he was given 300 million and they even broke the transfer record for him. He was not a failure , but he was not a success. We are not an oil rich football club. We are run from the money we make as a club. "في مباراة الانتر ضد برشلونه كان الجميع يتحدث عن ان انتر ميلان كانو اسياد الدفاع بوجود طرد و10 لاعبين لكنهم قد نسو بان مباراة الذهاب قبلها باسبوعين انتر ميلان فاز 3-1 وكان يجب ان تكون 5"
I liked Jose, I really did, but this is screaming desperation on his part. Top top man. Will get a top job soon and will blow teams away. Mou is trying to talk himself up for his next job. There are still teams that would fall for that historical blab🙄..Probably PSG. Philosophy? What Coaches hide behind when their influence is waning. The last statement is the absolute truth! The round plugs in square holes. I won't lie. I enjoyed watching this. Made some really good points as well. Jose would be a serious pundit. I don't know why because I loathe Mourinho but I enjoy listening to him. Have to agree. However, he clearly lost the dressing room at Man U.
Mourinho is so overrated. Since the treble with Inter what has he done except collect a big paycheque, acquire players and keep his teams average. Give him a weak team and let’s see what he can do. Clearly Woodward did Jose dirty but again at what point is Jose going to take responsibility ? Not his biggest fan but he’s talking nothing but the truth here. His philosophy is a bluff that everyone has caught on too. Probably a copy of what he saw Sir Bobby Robson do at @SportingCP_en, @FCPorto & @FCBarcelona. Yes true it depends, it depends what kind of players you have... what kind of support the club is giving you. Abeg he should get out with his siege mentality. The stats don't lie.